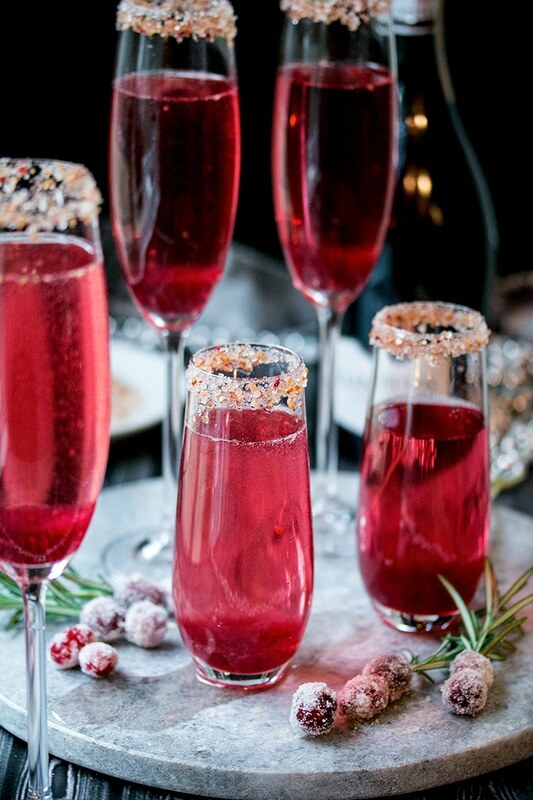 A sparkling holiday cocktail created with the seasons quintessential flavors of cranberry, rosemary and ginger and made to sparkle with Lunetta Prosecco. This post is sponsored by Lunetta Prosecco. All opinions are, as always, our own. 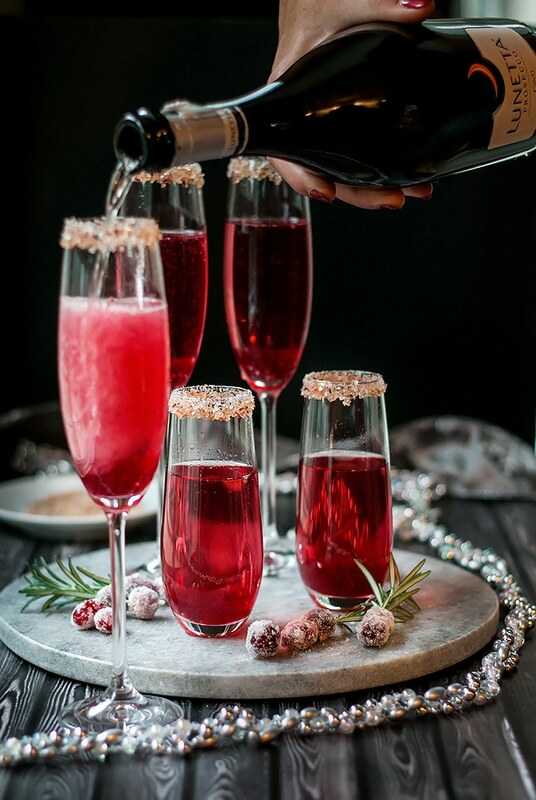 Christmas and cranberries go hand in hand so we made this holiday mimosa by sweetening up whole cranberries in a rosemary and ginger infused simple syrup to create a fragrant fruity and christmasy thick syrup. 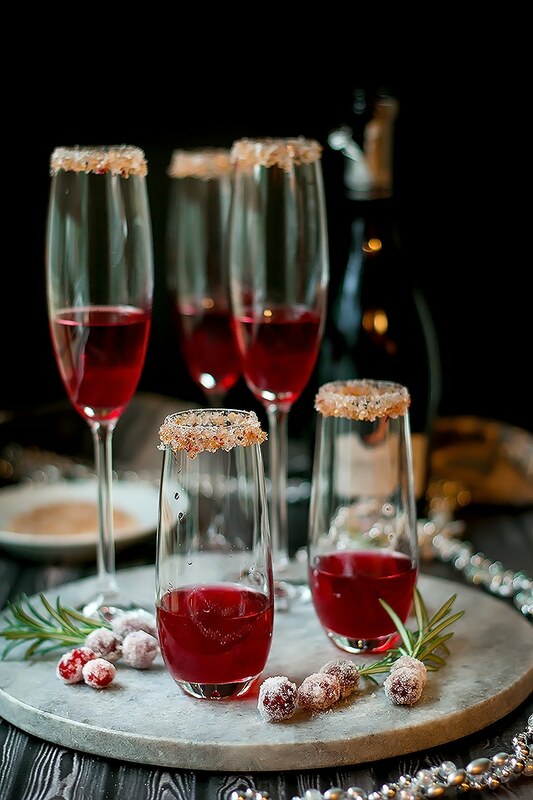 Top that with Lunetta Prosecco, or your favorite sparkling wine, and you have a serious holiday cocktail winner that your guest will love. And lets be honest, mimosas are so stinkin easy to make so Debbie and I love them for entertaining any time of the year. You can make the flavor addition ahead of time and then just add a couple tablespoons of it to a glass, top with sparkling wine and boom, your done. Its sooooooo easy. Easy to make many at a time and easy to refill your guests glasses. 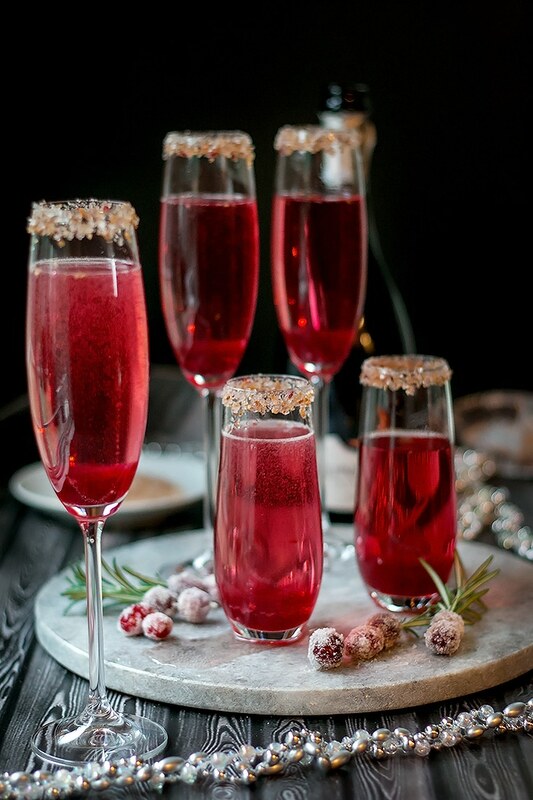 Its fun to serve a holiday cocktail to guests. It makes your guests feel special and adds a touch of class to your party. Even if you just serve one as guests arrive. It lets them know you were thinking of them and you care about their experience. We loved the Lunetta Prosecco that we got to try when we created this post. It’s light and refreshing with flavors of apple and peach. To be honest, we opened a bottle straight away and had to open another to finish making this cocktail… Its an Italian sparkling wine produced by Cavit which is recognized as northern Italys largest and most reliable source of quality varietal wines. We also sampled the Rosé version which was equally tasty with its fresh, fruity flavor. We enjoyed this particular sparkling wine so much that Debbie had to call my brother Matt to pick her up and drive her home. I’d say that’s a pretty good indication it was delicious. Amiright? This will be our last post before Christmas. Things are busy for us around here as Kevin and I prepare to move into the upstairs suite of our new shop by the end of the year. Debbie and I wish you all a Merry Christmas and we hope your holiday is filled with friends, family, and, of course, delicious food and cocktails! 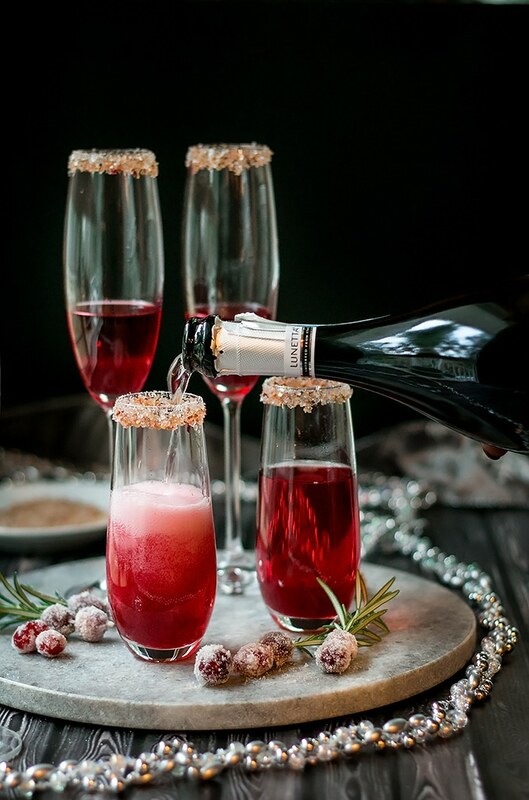 A sparkling holiday cocktail created with the seasons quintessential flavors of cranberry, rosemary and ginger and made to sparkle with Prosecco. In a small sauce pot, combine the sugar, juice, rosemary and ginger. Bring it to a boil and let the mixture simmer for about 30 mins or until the cranberries soften and pop open. Remove the rosemary sprigs and mash the cranberries pretty well. Simmer for another little bit until the mixture gets thick and syrupy (maybe 15 - 20 mins). Remove from heat and let the syrup cool completely. It will store in the fridge for a week easily. 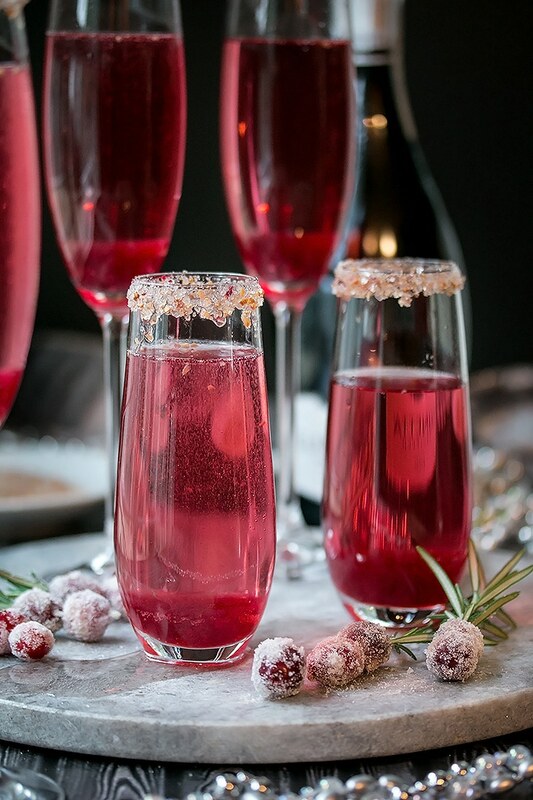 When you are ready to make your mimosas, add 2 tablespoons of the cranberry mixture to each glass if you are using flutes. If you make these in wine glasses, you might want to use a bit more of the mixture. 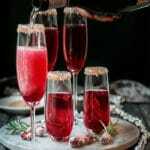 Top with chilled sparkling wine, give it a little stir and serve. Thanks Jess! Happy Holidays to you as well! 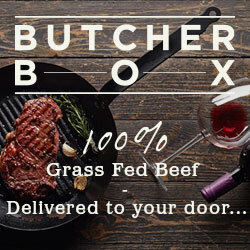 I am very excited to try this for our Christmas dinner cocktail! I would love to know what you used on the rim of the glasses in the photo. Hi Katie, we just used a store bought cranberry rim sugar for this one. Hey! Does this also work with white cranberry juice? Thanks for the recipe! I made it and the flavour was amazing! I had lots of compliments. I have a couple of questions for you. Firstly – did you strain the cranberry mixture before letting it cool? I found it was really chunky and had seeds from the cranberries so I ended up straining it. Also, did yours go kind of like jello a bit? I put mine in the fridge and it turned into jello, so I took it out of the fridge and shook it a lot and it helped, but it ended up sitting at the bottom of the glass instead of mixing it. Do you have any suggestions for this? Should I use more liquid to counteract the cranberries natural gelatin properties, or avoid refrigerating? Hi Stephanie, glad you loved the flavors! Yes, you can strain it for sure, we just leave it. The seeds sink to the bottom. You could also blend the mixture before straining it to get rid of the chunks if you don’t want any. Yes, it can get gellish when you put it in the fridge. Either leave it out of the fridge if your going to use it quickly or maybe add a little water after its done cooking before it cools completely. After cooking the cranberries (with ginger and juice; tho the recipe is unclear), wouldn’t that turn into cranberry sauce and be too thick to use in a cocktail? Hi Michele, did you try the recipe? The cranberry mixture becomes jammy and blends into the cocktail when stirred.